Archaeologists believe they have discovered the remains of Blackbeard's ship, the Queen Anne's Revenge, in the waters off the coast of North Carolina. Though Blackbeard, aka Edward Teach, enjoyed only a brief (two year) career as a pirate, his legend has lasted almost three centuries. In 1718, Blackbeard was killed and beheaded by naval officers acting on the orders of Virginia's governor. (His head was suspended from the bow of a navy ship as a warning to other pirates.) Legend has it that when his headless body was thrown overboard, it swam around the ship several times before sinking. As for treasure, aside from a few bits of jewelry and some artifacts that only an archaeologist could love, there's unlikely to be much aboard the Queen Anne's Revenge. 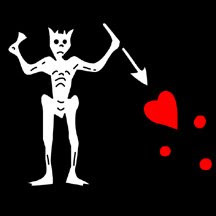 If, as many believe, Blackbeard did indeed have a treasure, it's still out there waiting to be found. that is so awesome, what happened to his head afterward, did it just fall into decay? If you want a good pirate book, go for Piratology. All of the "flag clippings" are obviously fakes, but there's good info in there.